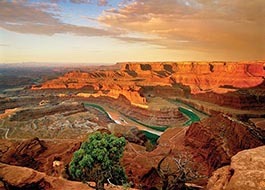 Experience Canyonlands National Park as few ever will. Every twist and turn around the awe-inspiring goose-neck bends in Cataract Canyon will take you on a journey of discovery you'll never forget. 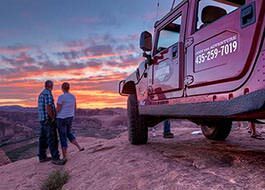 Just thirty minutes west of Moab, Utah you'll board our customized high-speed rafts that will carry you on this two-day, hundred-mile Colorado River voyage in comfort. Our experienced professional guides will fill your head with stories and facts about ancient Native American civilizations and local folklore, as you take in the majestic, pristine panoramic views. 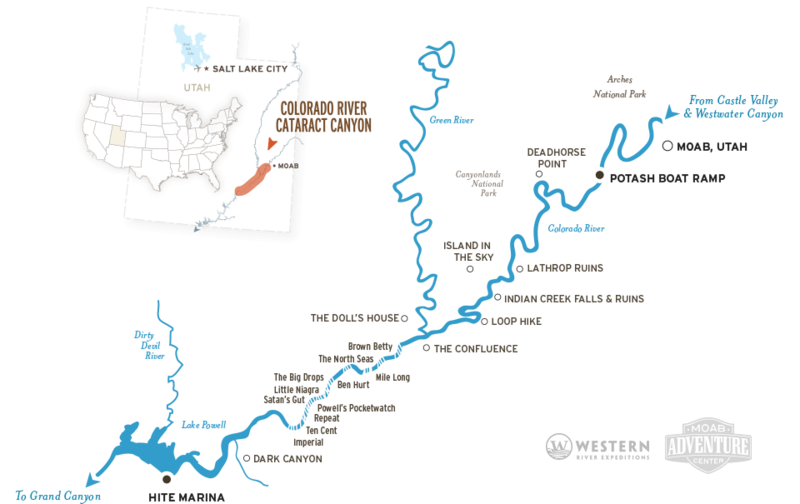 With a maximum group size of fourteen, you'll soon begin to feel like you've become a part of this remarkable canyon, which will give you your right of passage to drop into a series of nearly thirty whitewater rapids that make Cataract Canyon legendary. 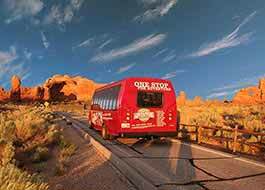 Your journey will end on the scenic still waters of Lake Powell, where you'll be transported by ground shuttle back to Moab. These will be two spectacular days you'll hold precious for the rest of your life, so what are you waiting for? Come join us. If Western River's J-Rig Rafts are the "Cadillac of the Colorado River", then Snout Rigs, despite the ugly name, are like the "Corvette of the Colorado". The flat water before and after the 30 mile stretch of whitewater in Cataract Canyon will be nothing but a breeze with the 90 HP motors and shallow draft pontoons - and there's still enough room to bring the comforts for camp! 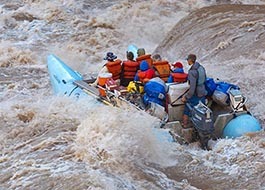 The rapids in the heart of Cataract Canyon are among the largest in North America - especially after a heavy snowpack. Experiencing these rapids at full throttle (well, ok full throttle with these boats wouldn't be wise) will give you the full frontal assault, with dodgy little maneuvers by skilled guides to make the most of every ride. 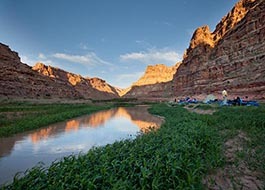 There's nothing quite like camping on the shores of the Colorado River, deep in a canyon somewhere in the Desert Southwest. Your guides will prepare lunches, dinner and breakfast on this brief 100 mile journey that you might be surprised by - where did they store all those cots, tents food and ice? Found you online, but then called in to get some details worked out. I was amazed to get a "real person" to answer the phone and they were delighted to help me... made my decision instantly. Everything on the web is awesome and answered nearly 100% of our questions... very well done guys. 1st class all the way. Our guide was the right mix of personable, expert, fun, sharing/talking, and helped make the trip 2X better. Helped that the weather was also amazing...but seriously, every detail was perfect. I can't wait to come back. FIRST RIVER TRIP BUT NOT THE LAST! This was a trip in celebration of my daughter's birthday (her choice). First river trip for both, she was excited, I was terrified! What an amazing, wonderful, FUN experience. Days later we are still "up" talking about it. All information given before the trip was accurately represented. Delicious food, comfortable sleeping , wonderful service, awesome guide, exhilarating whitewater, all among the most beautiful, captivating country in the world! We wanted to immediately turn around and do it all once again. 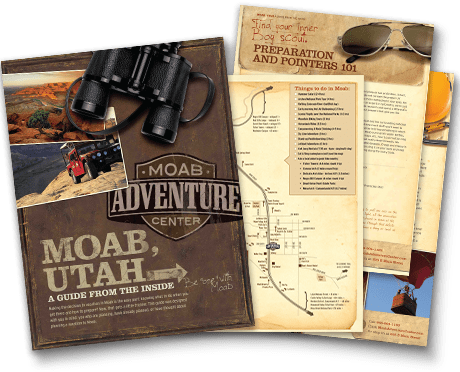 Experience an all-inclusive 4 day rafting journey through Utah's legendary Cataract Canyon just outside of Moab Utah. 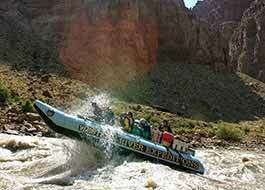 Exciting whitewater combined with the indescribable scenery of Canyonlands National Park make this the ideal river trip.